Are you looking for a great gift for the person who thinks that they might already have everything they need? MS Office 2019 Gift Cards from Prezzee are the perfect choice for people who like to send and receive useful gifts. This Voucher includes: For 1 PC/Mac, Fully installed versions of Word, Excel, PowerPoint, and OneNote, Store files in the cloud with OneDrive. One time purchase per user. 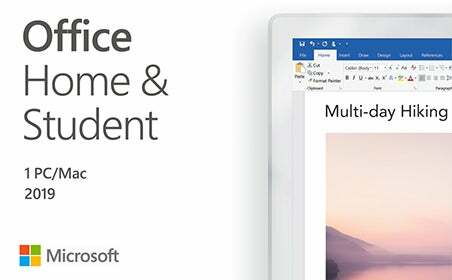 MS Office 2019 PC/Mac is all of the utility and innovation of the MS Office suite designed for 2019. Perfect for students, sending your MS Office 2019 PC/Mac Gift Card from Prezzee could be the perfect way to send a newly graduated student off into university life. Purchasing your eGift Card from Prezzee is quick and simple. We have developed an innovative solution to the age old problem of losing or forgetting about your Gift Cards. With a digital voucher, you can still give someone the perfect gift of choice but now they won’t accidentally leave it at home just when they need it. With our secure online payment system, simply log on to the Prezzee website or App, select your MS Office 2019 PC/Mac Gift Card for your desired value and purchase it. You can send a free egreeting card with your Gift Card from a range of Prezzee themes and relax knowing that your present got to its recipient in time. There are no additional postage or handling fees and once received, your gift can be redeemed instantly. With the Prezzee App you can download all of your Prezzee Gift Cards and have them ready and waiting to redeem on any smart device.